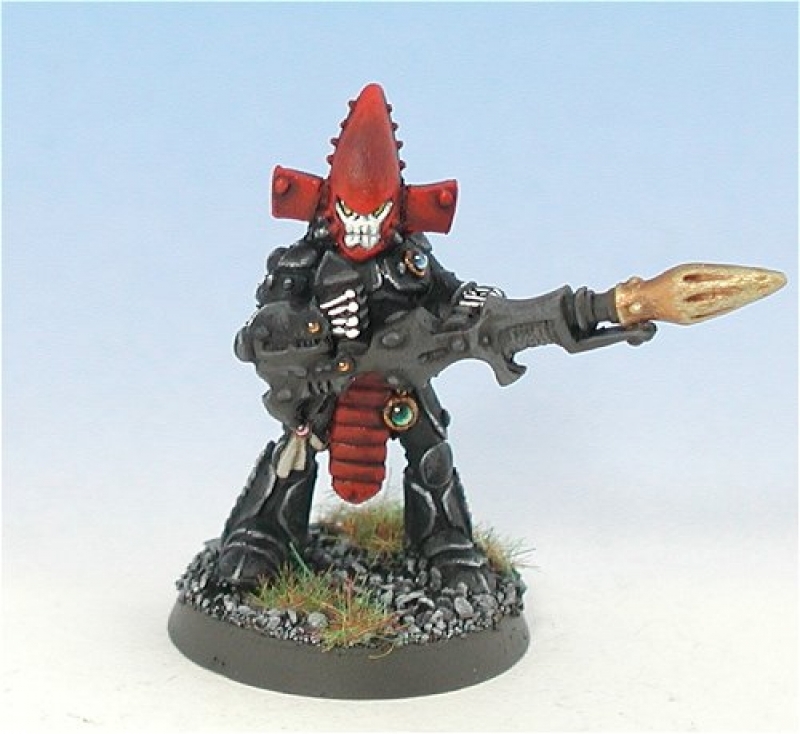 This Eldar force is the start of my own original craftworld army - El Ìlm Craftworld. They are purists in every sense of the word, with creams and whites combined with traditional runic script. 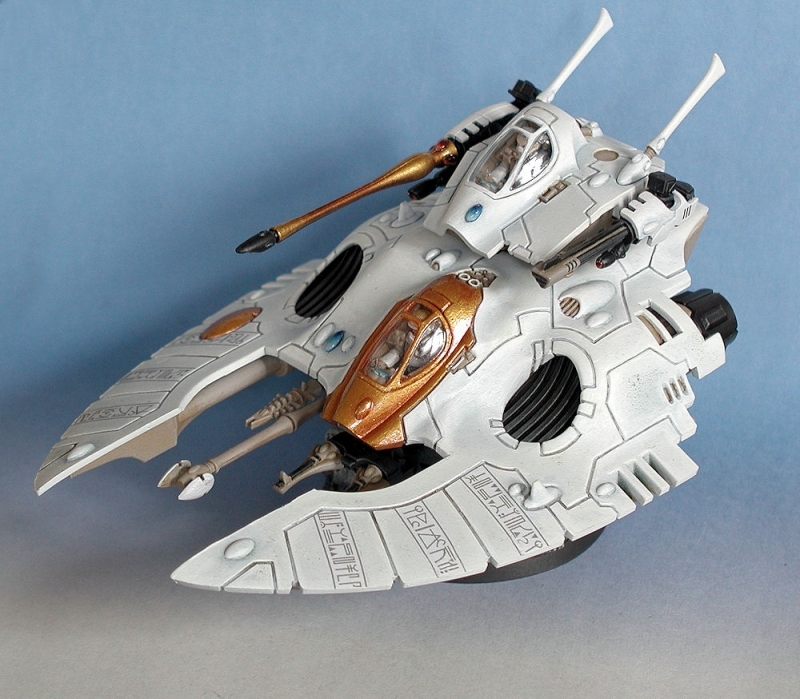 I'm currently working on creating my own runic script transfers for the canopies of my growing jetbike squadron. Here's the elf in charge so far - a lowly warlock! 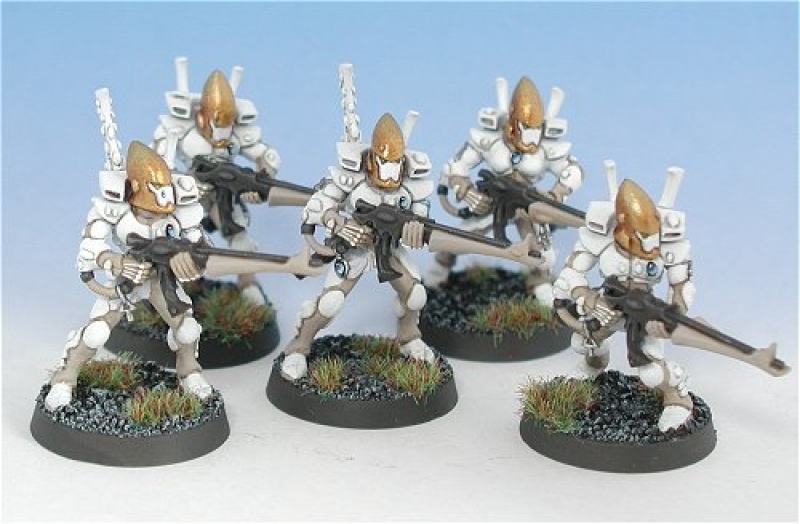 The basic army colour scheme is white and beige, with charcoal grey weapons and bronze helmets. Gems are mostly blue, except weapon gems which are red. I've kept silver out of their colour scheme, and the metal would be reserved for special, intricate stuff by their craftworld. They may not be a terrifying foe to face in battle (entirely my fault! 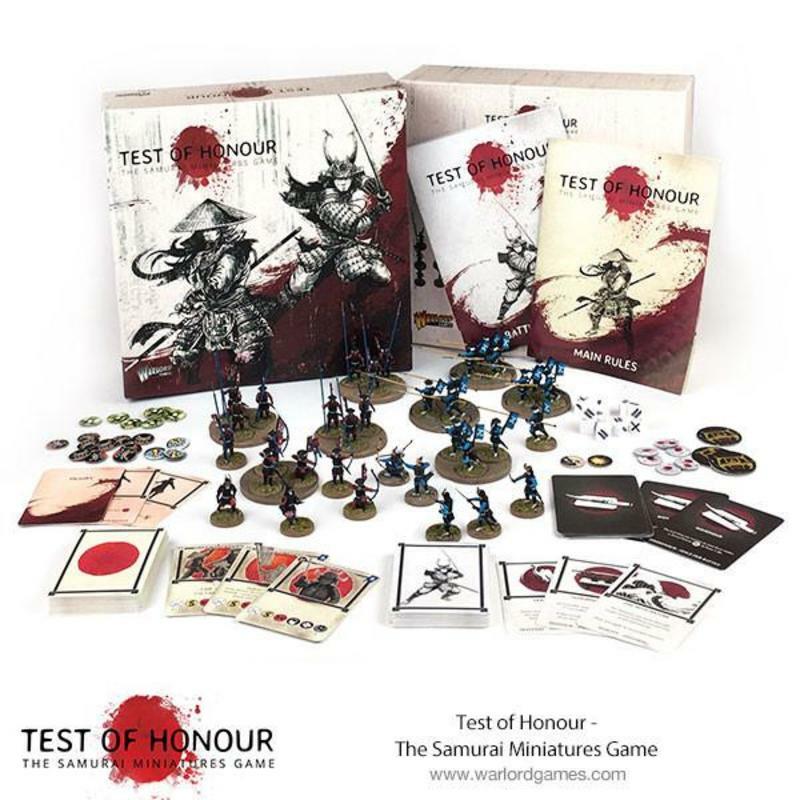 ), but, by the gods, they will look good on the battlefield! :) Here's part of the warlock's guardian squad, decked out in their finery. Snappy dressers, eh? 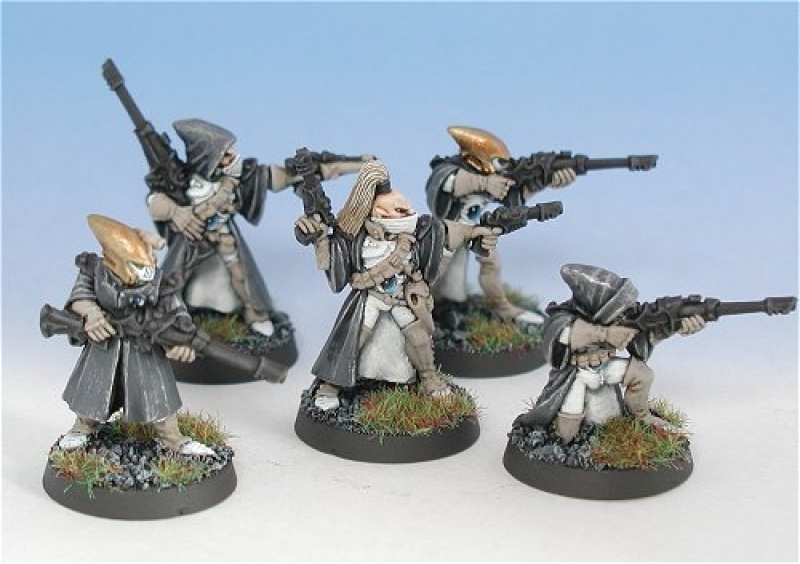 The problem with such a sparklingly pristine colour scheme is how the heck do you make camouflaged scouts?! I took ages trying to find a colour scheme to reflect the unearthly qualities of their camo-cloaks, but in the end I had to settle for grey cloaks with flecks of silver. sigh... These are very old scout models, which is why they are all carrying lasguns rather than the cooler sniper rifles. I rather enjoyed painting these war-walkers, but they took AGES to get to a clean white!! The guy in the middle is preparing to do battle with a wraithbone sword, which is probably not all that clever, really. But it looks nice. 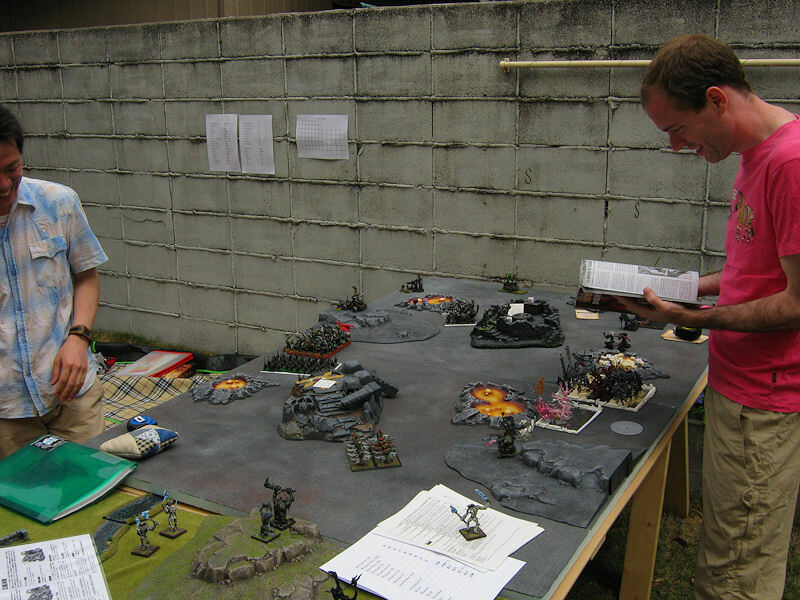 I like the contrast of seeing such bright whites against the grimdark greys of the battlefield terrain. I painted up all the weapon options for these guys, which can be swapped out on delicate pins. See? 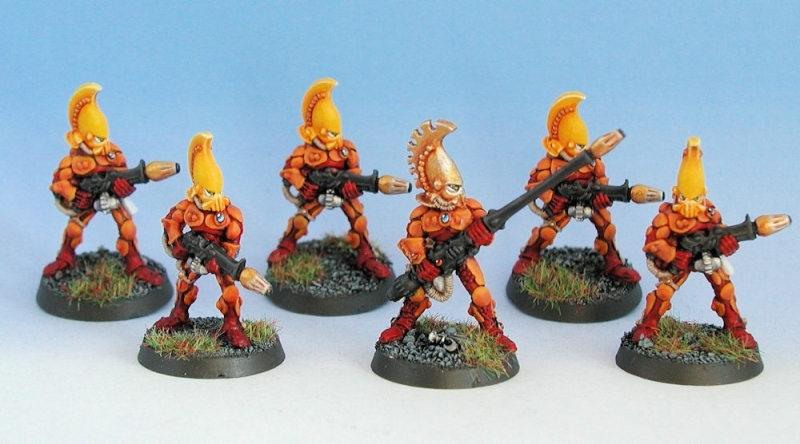 Even the craftworld's aspect warriors are kind enough to stick mostly with the uniform colours! And then go and spoil it with flashy red helmets. 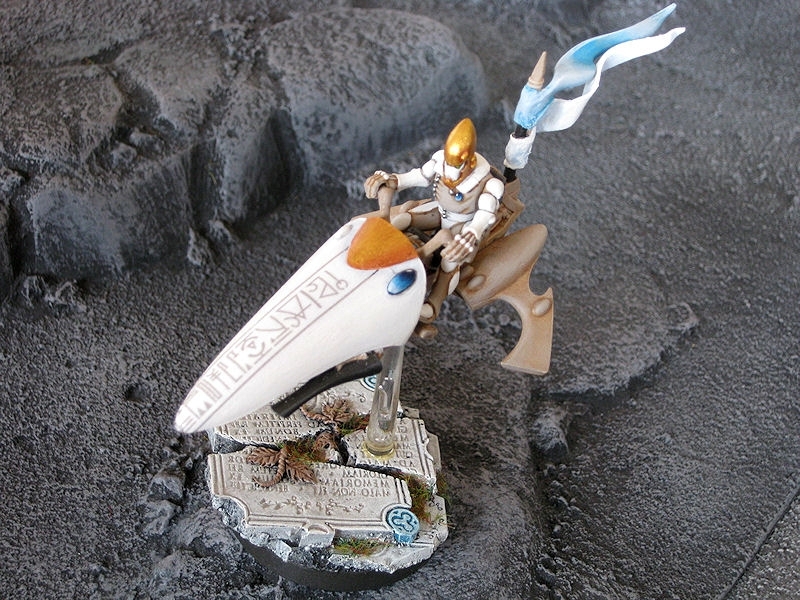 Here's the first of the jetbike squadron, with the first of the runic water transfers. It's nothing super special in terms of decoration, but it makes it look a little more religious (?) and ornate, I think. "Hurrah, we don't have to walk anymore!!". After trying out the runic transfers on the first of the jetbikes, I decided it was time to paint the first of the grav-tanks. The underside is the normal Dheneb Stone colour, and the rest was painted with a matt white undercoat and shaded carefully down to Space Wolf Grey. 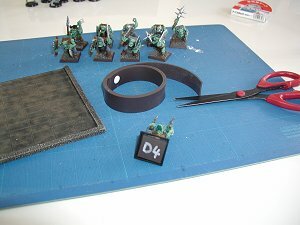 After careful blacklining with Black Wash, I applied stripes of the runic transfers on the front cowling. Now I know the colour scheme works, I can be a bit more adventurous on the next one! I finally have another Troops choice now. 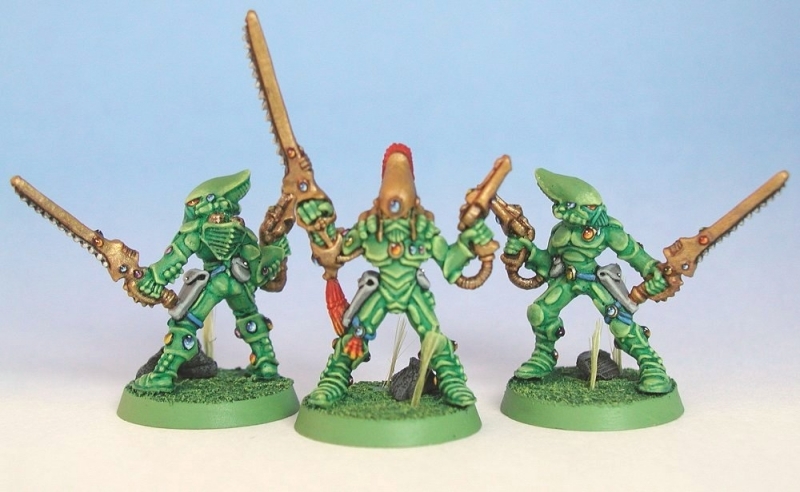 These are five old metal Dire Avengers, which are not much different from the newer plastic sculpts except for the mouth grills, lack of shoulder pads and shorter weapons. Nice dramatic poses on them though! 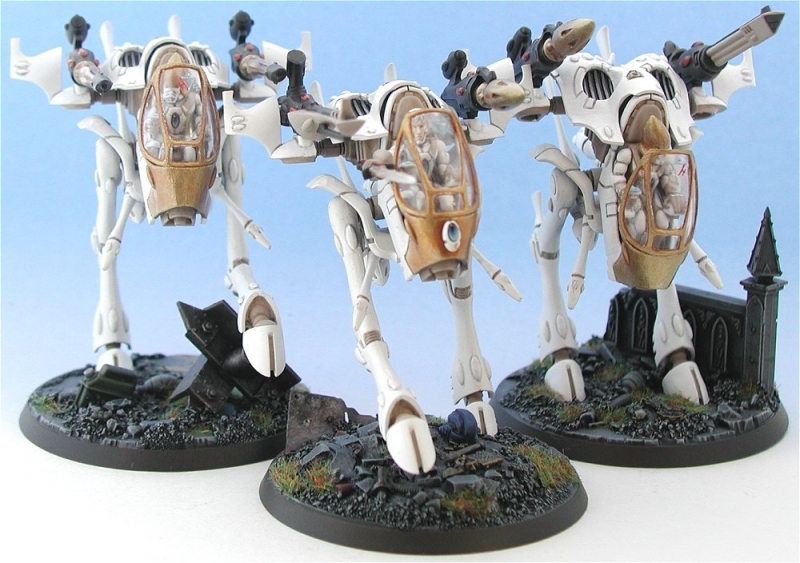 I really have to get some more of these, and perhaps an exarch, before they'll achieve much on the battlefield. El Ìlm Craftworld finally has its first Farseer ready to step out onto the battlefield. This guy has proven very useful in recent games, vastly improving the shooting phase, so I thought it was about time to paint him up. 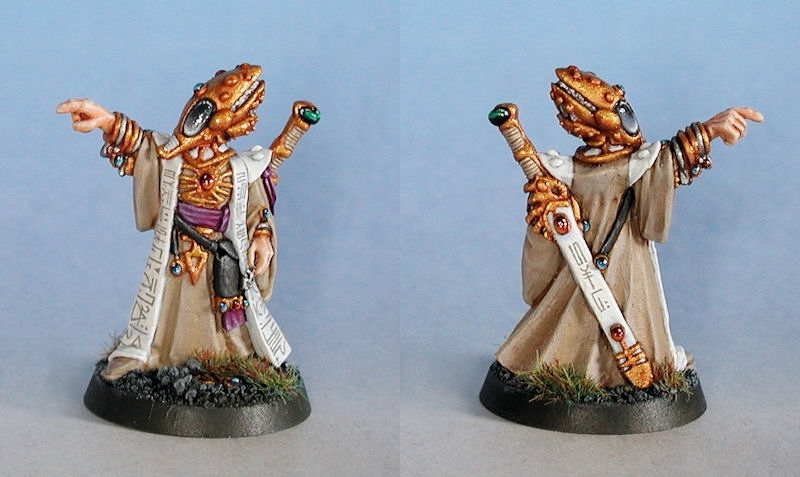 I envision this Farseer as being older than most on the battlefield, and therefore closer to the time when his spirit will join the craftworld's infinity circuit. I painted him with smokey grey eyes and plenty of handpainted runic script (approx 2mm in width!! 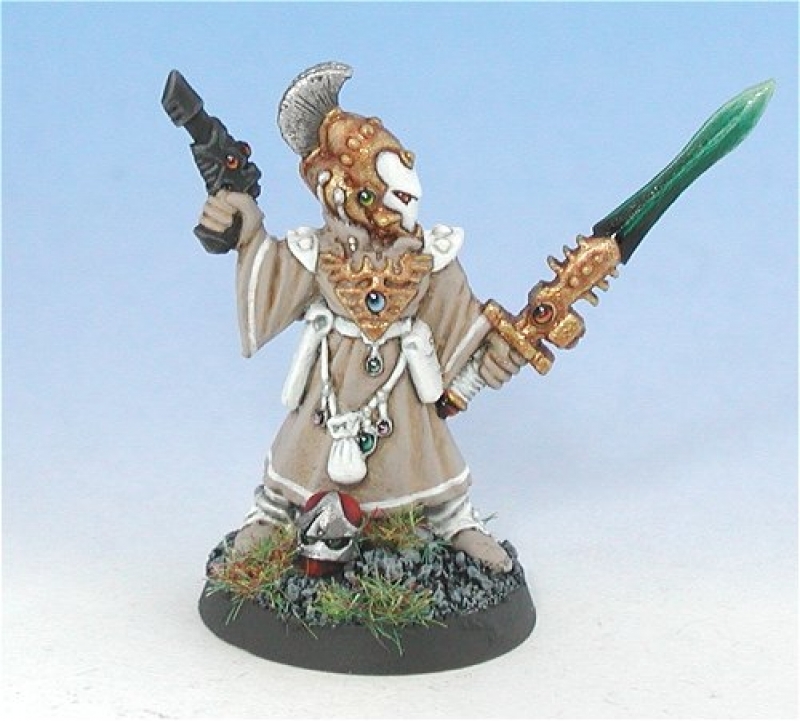 ), so as to suggest he is more attuned with the spirits - his battlefield role will be to guide the Wraithguard and Wraithlords of El Ìlm Craftworld. I like this model for the one reason that he's obviously not concerned with fighting in the conventional sense - his powers do the real damage. "I doom you..."
Some great looking miniatures there! How did you do the writing on the bike? It looks too precise to be freehand. PS. Great base on the bike. Well, I could lie and say it's freehand! :) But it's actually an A4 sheet of water transfer paper. Found an eldar runic alphabet online, and then it was easy to print out on the computer. Strongly recommend it! Bases are from Dragon Forge, I think. I wanted something a bit special, since they're so big. They might be an excellent army in the new edition, but I'm certainly not the excellent general they need! But they're great fun to use (making the pew-pew noises as scatter lasers open up, and zooming noises as the jetbikes go 60"! ), and they look real pretty. Dead, usually, but pretty. I like it. Very smart.